The poetry of the Comedy emerged from beneath a sea of exegetical commentary for the first time in more than twenty years in this edition produced by the most celebrated printer and publisher of Renaissance Italy, Aldus Manutius. The text differed radically from the Landino vulgate which had established itself during the last decades of the 15th century. The text of the 1502 Aldine, which was to become the vulgate for the next 300 years, was prepared by no less than the literary arbiter of the Italian High Renaissance, the Venetian humanist and courtier Pietro Bembo (1470-1547). Bembo is most familiar outside of Italy for his Neoplatonic discourse on love in the last book of Castiglione's The Book of the Courtier, or for Titian's majestic portrait of him (1540) shortly after his elevation to the cardinalate. 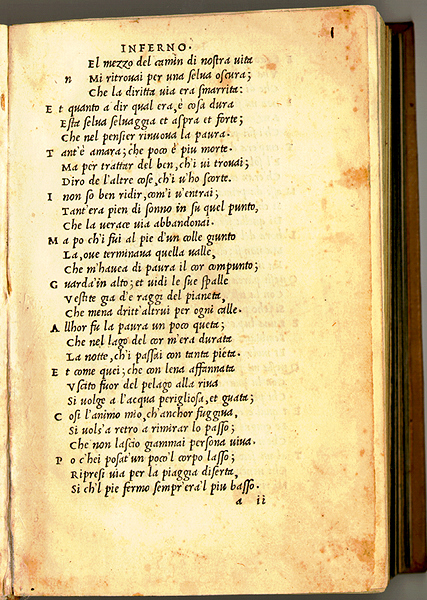 Bembo had already prepared for Aldus in 1501 an influential edition of Petrarch's Canzoniere. 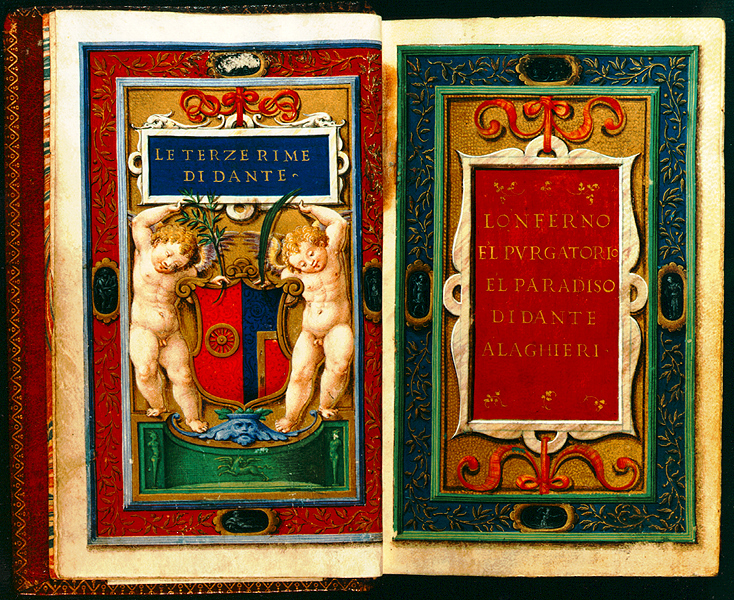 Together with his 1502 Dante, Bembo's editions of the vernacular Italian classics represent the practical (and polemical) point of departure for the Venetian's promotion of a vernacular literary tradition. His efforts in the philological, editorial, and poetic arenas led to a general recognition of a distinguished vernacular tradition worthy of canonization no less than the Latin and Greek traditions idolized by the humanists. 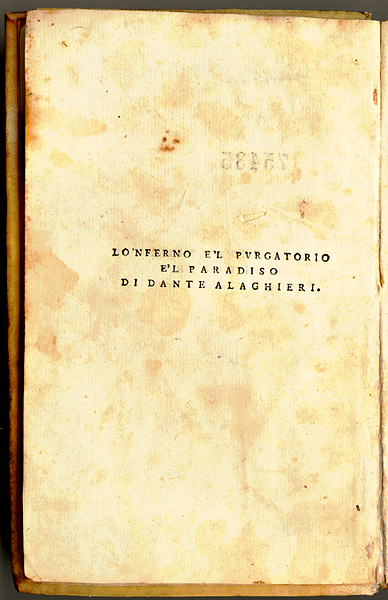 Bembo's linguistic and rhetorical reform of the Italian vernacular found its mature expression in his vernacular humanist manifesto Le prose della volgar lingua (1525), where the Venetian proposed the 14th-century classics Petrarch and Boccaccio as vernacular models for poetry and prose respectively, just as Virgil and Cicero served as humanist models for Latin eloquence. 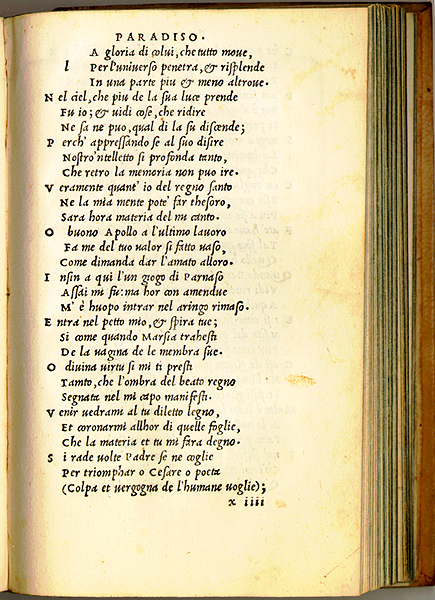 Thus, the linguistic provocation of the non-Tuscan incunable editions of the Comedy to which Landino had responded in 1481 was renewed at the beginning of the 16th century by this Aldine edition of the poem. 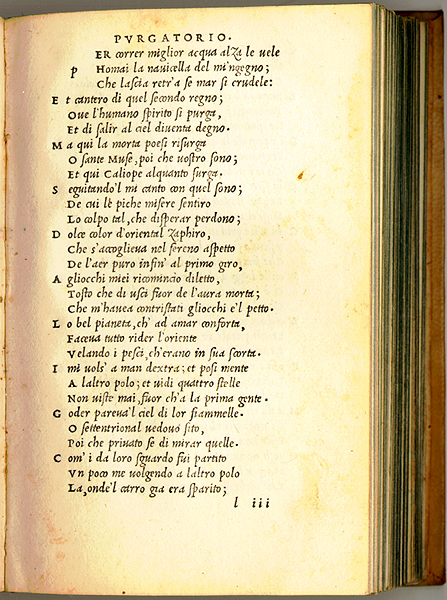 Bembo, a member of the Venetian patriciate, presumed to teach the Florentines about their own vernacular classic and their own language. In fact, Bembo's edition was undertaken with a philological acumen unprecedented for vernacular works and unusual even for Latin classics. For the first time, the text's abbreviations were explained and the words divided according to grammar. Punctuation is abundant, and the use of the apostrophe and many accents are regularized. 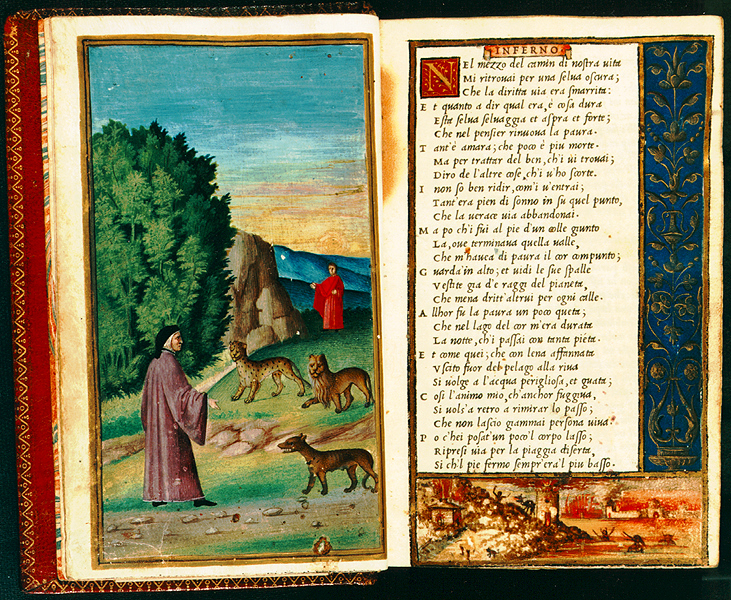 Most importantly however, Bembo circumvented the corrupted 15th-century Landino vulgate by basing his text upon an authoritative 14th-century manuscript of the poem, which, originally a gift of Boccaccio's to Petrarch (Vat. lat. 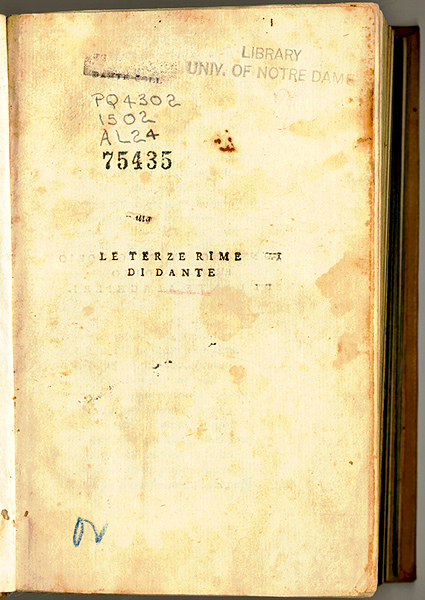 3199), had found its way into the formidable library of Bembo's father, Bernardo. Bembo copied out the entire text in his own hand (Vat. lat. 3197) and presented the copy to Aldus for printing. 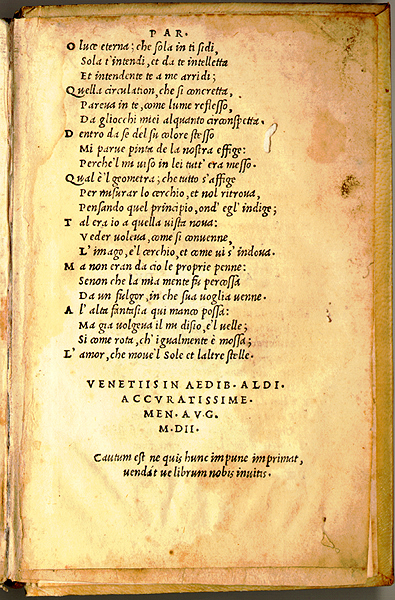 Although Bembo's Aldine edition represents an important advance in the philological recovery of the vernacular classic, paradoxically it marks the beginning of a process of marginalization of the Comedy within the context of the Italian literary canon, especially in relation to Petrarch -- a trend which in Italy would not be fundamentally reversed until the 19th and 20th centuries, by Romanticism and Modernism respectively.